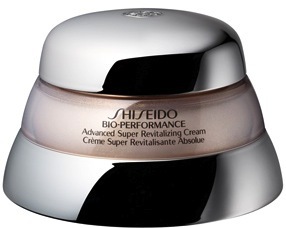 Shiseido Bio-Performance Advanced Super Revitalizing Cream. Breathe In... add some more words to the name, why doncha. While purchasing a bunch of Shiseido products in Arnotts lately, I was busily engaging the lovely SA and finding out as much about the brand as I could (I'm sure I bore SA's rigid. I use them and abuse them for product information...). Said lovely SA was more than kind to give me a handful of samples of the Shiseido Bio-performance Advanced Super Revitalizing Cream for my own personal use, promising me that after use, I would be back to purchase, so I've been using these samples for the last week or so, with different serums (day and night) to see what I thought. This stuff is nice. It's intended for younger skins (who hoo, my skin is still considered "younger"! *ahem*). Their Bio-Performance range also features two additional moisturisers, the Advanced Super Restoring Cream and the Advanced Super Revitalizer (Cream) Whitening Formula. Maybe some snappier names would be helpful, but onwards. These are not cheap, at around the €100 mark, they're starting to approach CDLM territory. The Bio-Performance range targets age-related concerns (OK, I guess it's all relative, maybe my skin isn't that young-looking after all) and there are complementary serums and eye creams in addition to the moisturisers. This has a cream-gel texture, you probably know the drill; lighter than cream, thicker than lotion. At the point in time I was trialling it, my skin was more sensitive than usual (I'm detoxing at present, and I find that when I do this, my skin breaks out and definitely becomes more sensitive for a week or so). It was very comfortable on my skin, and definitely helped to calm it down, so I can definitely say it should work with sensitive (or sensitised) skin. In addition, as I've mentioned before in many a previous post, I have combination skin, and this was both hydrating enough for the dryer areas and non-overloading of the slightly-oilier areas. If I were to add a small caveat, I have the feeling that it may not be sufficiently hydrating during winter time, when my skin is hassled by the heat-and-cold extremes of indoor-and-outdoor yo-yo-ing (that's a lot of hyphens!). But that's only on the basis of my experience in the past with creme-gel formula skincare products, and not this one in particular. Would I purchase? Probably during the summer time, yes. I will stick with my usual winter skincare routine. Would I recommend? For normal, mildly oily and combination skin, I don't see why not. For dryer skins, I wouldn't be too certain.